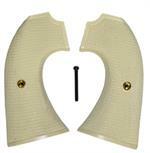 Beretta SA Stampede Ivory-Like Grips With Steer on Right Panel. 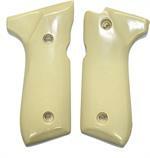 Beretta Model 92 Ivory-Like Grips. 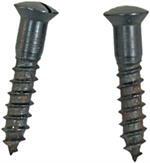 Grips Also Fit 92FS, Model 96 Centurion. 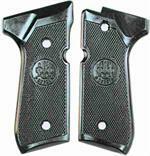 G97 Beretta Tomcat Model 3032 Grips, .32 Cal. 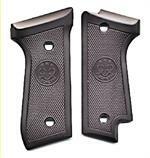 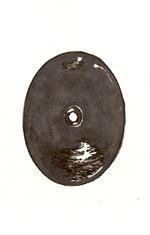 Beretta Tomcat Model 3032 Grips, .32 Cal. 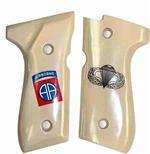 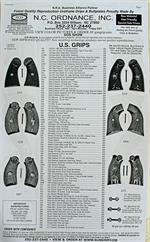 Beretta Model 92FS 9mm Grips, US Army Model 9. 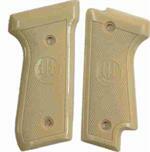 9mm Double Stack Magazine. 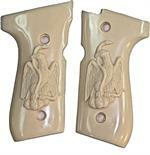 Has the Decock.